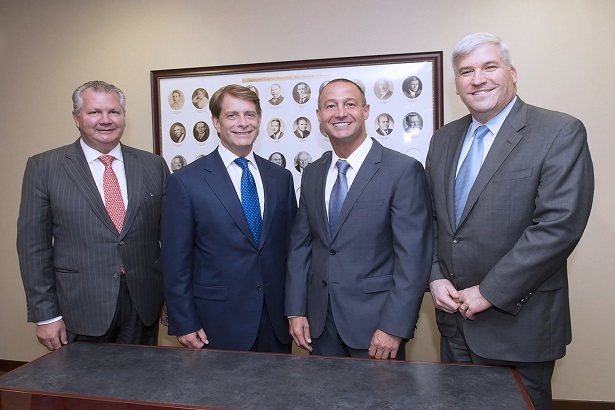 Pictured, from left, Ihor S. Sawczuk, MD, president of Hackensack University Medical Center; Robert C. Garrett, co-CEO of Hackensack Meridian Health; Warren Geller, president and CEO of Englewood Hospital and Medical Center; Michael T. Harris, MD, chief medical officer at Englewood Hospital and Medical Center. August 2, 2016 – In April 2015, Hackensack University Health Network, now known as Hackensack Meridian Health, and Englewood Hospital and Medical Center (EHMC) entered into a clinical and academic affiliation to allow both health systems to expand patient care services and develop new collaborative programs throughout the region. More than one year later, the affiliation continues to strengthen, with numerous strategic projects and efforts underway. Work continues on the planned implementation of Epic, an integrated, state-of-the-art electronic medical record system, at EHMC. The affiliation has allowed for an accelerated and cost-effective implementation of Epic, which will enable seamless care for patients seeking care at both institutions through a shared platform. Hackensack Meridian Health, which has been using the Epic system since 2010, is working in partnership with EHMC on the project to ensure a successful implementation in 2017. In January 2015, Hackensack Meridian Health and Seton Hall University announced plans to establish a new school of medicine, based at the state-of-the-art campus of the former Hoffmann-La Roche Inc. biomedical facility in Nutley, New Jersey. EHMC’s new class of internal medicine residents, who began in July 2016, are now sponsored by Seton Hall University. In addition, EHMC is now a training site for a Hackensack Meridian Health sponsored emergency medicine resident and the Seton Hall University Physician Assistant Program. The institutions are discussing collaborations in a number of other allied health fields. One of the primary goals of the affiliation is to enhance access to care for residents of Bergen County and beyond. Current clinical partnership efforts within the affiliation include oncology, behavioral health, electrophysiology, cardiac surgery and pediatric subspecialty care. As health care increasingly moves toward population health management, the affiliation will create regional models of care with an emphasis on difficult-to-access services targeting multicultural communities, preventive medicine and early intervention. Several operational and financial benefits are also being realized through the affiliation, working with commercial payers and with suppliers.